Much like CES has become a trend barometer for the trade show segment, South by Southwest has become an experiential Petri dish for b-to-c marketers. 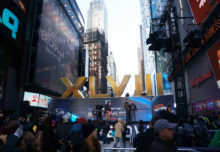 There was a time when a pilgrimage to the Daytona 500 or NFL Experience gave b-to-c event marketers a taste of the year’s pending trends and best practices. No more. If you want to know what’s coming in experiential marketing, if you want to see new engagement trends, if you want to see what’s next… put “South by” on your event team’s annual field trip schedule. As you look across the many activations peppered throughout Austin’s annual 10-day conference trifecta, you will see new trends being tested, emerging best practices put into play and an overall experiential marketing rulebook being tweaked in real-time. 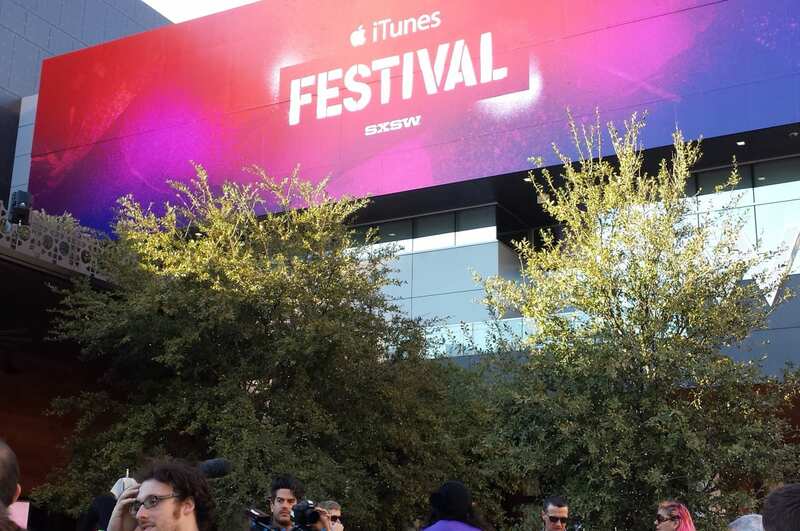 This year’s South by Southwest started on March 7 as a music conference and then morphed into a film conference before ending as an interactive conference on March 16. Over the years our team has dropped in on all three portions at the Austin Convention Center and surrounding downtown. This year we swung into the interactive leg to take a look at which brands were standing out from the pack. A Cliff’s Notes version of what you missed begins now. IFC has been a sponsor of SXSW for several years, but for the first time, it dove into the Music end of the pool. 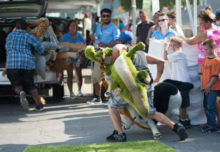 From March 12 to 14, the channel took over Austin’s Palm Park, right next to the Convention Center, with its IFC Fairgrounds activation—a part carnival, part state fair and all-Austin weird experience. The main events featured music, of course, and the brand lined up a schedule of typically off-beat and just-under-the-radar bands like Streets of Laredo, Les Claypool’s Duo de Twang, Panama Wedding and Bear Hands. While enjoying the tunes, guests got a shot at some old school carnival games like balloon darts and corn hole, a three-lane slide sponsored by Twizzlers and some ice cream treats inspired by the series “Portlandia.” In addition to the main stage, bands played in the “Deep End Theater,” a multimedia lounge at the bottom of the park’s empty pool. Local food trucks supplied the food and a beer tent supplied the brews. In addition to its partnership with Twizzlers, other partners contributed to the experience including Doritos, which provided free chips to Fairgrounds attendees, Hotels.com, which hosted guests in a hotel-style lounge inside the Fairgrounds and Joe’s Crab Shack, which set up a “Jersey Shore”-style “Game Shack” of fairground games and prizes and, for one hour each day, free specialty cocktails for VIPs. Agency: LeadDog Marketing Group, New York City. 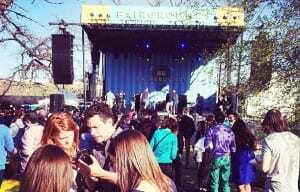 To drive viewership for its original TV shows, Comedy Central on March 14 hosted an afternoon “Kegs and Eggs” party during the music segment of the Festival. Held at 508 Tequila Bar in the heart of the city, attendees were free to enjoy a feast of breakfast tacos and beer—just the thing for those who may have imbibed a little too much the night before. Later that night, the network hosted the world premiere screening of the Comedy Central stand-up special “Hannibal Buress: Live from Chicago” at the Alamo Ritz, which was followed by a Q&A with Buress, director Marcus Raboy and executive producer Neal Marshall. The special will air on March 29 at midnight. Agency: AWESTRUCK Marketing Group, New York City. We suspect many a dream came true when Pennzoil and Nintendo teamed up on a real-life Mario Kart experience designed to introduce consumers to the iconic video game’s eighth iteration for Wii U and to Pennzoil’s new Platinum Full Synthetic Motor Oils with PurePlus Technology. Pennzoil was the official Motor Oil & Auto Fuel sponsor of the Interactive festival, and Mario Kart 8 is due to be released May 30. 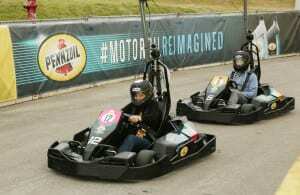 Located on a custom-built track at the Palmer Event Center, the karting activation, which was free for SXSW Interactive & Gaming attendees, leveraged RFID technology to mimic actual aspects of the game. For instance, to gain a competitive edge, participants could “collect” five Pennzoil Complete Protection icons by driving over them, triggering speed boosts, just like in the game. And—just like in the game—there were icons like Turtles, which caused the driver’s kart to reduce speed. A JumboTron captured the action in real-time, and as drivers passed certain areas of the track, the image showing each driver’s point of view on the screen flipped upside down, just as Mario and his friends “defy gravity” in Mario Kart 8. The brand promoted the hashtag #motoroilreimagined and captured the action on the event microsite, motoroilreimagined.com. Participants walked away with their own digital video link to their Mario Karting Reimagined experience, offering a helmet camera view of their track laps and personal “Complete Protection” score. Agencies: JWT and MediaCom ESP. The goal? Drive awareness for the new Flatizza and get the cool people of SXSW telling their friends. Solution? Eatovations, an interactive footprint giving attendees a “taste of the future.” The anchor of the experience was a mind competition in which two attendees battled while wearing NeuroSky Mindwave headsets (they measure concentration levels) to see who could concentrate more on an animated Flatizza. The headset posted real-time scoring to the screen as guests concentrated (so hard in some cases that we thought a few blood vessels might pop)—talk about a subliminal way to get somebody to stare at your product for 30 or 60 seconds without knowing they’re staring at your product. God bless you, gamification. Agency: 360i. 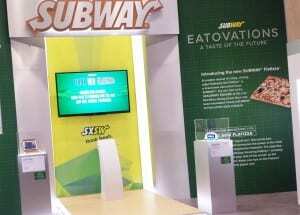 The best activation at last year’s SXSW came back even stronger this year with an upgraded concept that tied into the essence of South by Southwest and the Esurance brand. 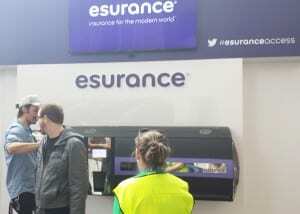 Consumers could sign up on-site to receive an Esurance Access Pass, a gold plastic card they used for a daily chance to score big prizes at the brand’s convention center Glove Box display. (They could also create a custom SXSW schedule). The card also granted access to a Fuel Lounge pop-up (at 6th and Trinity) offering beverages, couch time and phone charging. It also, and this is the best part, gave access to a rolling list of exclusive parties. To get the limited tickets to the parties you had to monitor the Esurance Twitter feed. Another great activation that turned information and access into empowerment. Agency: GMR Marketing. The best exhibit on the show floor during the interactive segment of SXSW, the NYT footprint was jammed the entire time. Like the print and digital namesake media brand, the experience was black, white and read all over. There were five pieces to the tech-driven engagement: First, attendees had a seven-second video taken of them, which was emailed to them as the main vid in a mock nyt.com homepage. Second, after the video was taken the guests were invited to move slowly as 16 photos were snapped of them—the images were quickly beamed to a printer/binder and turned into a custom flipbook. At the third interactive, guests could share their custom nyt.com homepage via social media. And then came station four, where people could subscribe to the Times (for 50 percent off for 26 weeks plus a free gift)—and finally station five, where they picked up the custom flipbook. Few 20×40 booths have this much action packed into them, playa. Agency: Sparks. The internet TV provider held an evening event to promote its original comedy “Deadbeat,” about a medium who can speak to ghosts. 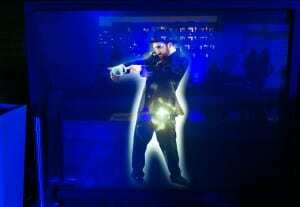 The theme of the show was brought to life via holographic projection that let guests interact with ghosts by taking photos and dancing with them at the party. A giant, interactive Ouija board let guests speak with ghosts (like the star of the show) by texting a question to the spirits and watching the board magically spell out the answer. A flipbook photo booth had a surprise ghost appear in the images. An Instagram print station allowed guests to view and print all #deadbeatsxsw photos taken during the week at SXSW. Agency: NVE: The Experience Agency. 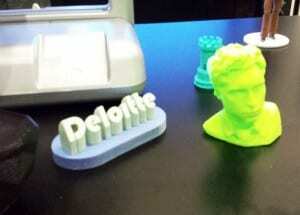 Looking to change some perceptions and get people to start thinking of the consulting giant as hip and high-tech, Big D set up its Realm of Possibility outside the trade show floor with a footprint featuring couches, information about the company and an interactive that scanned attendee faces and then printed them a mini 3D face for their desk (Cool? Weird? Or both? You be the judge.) Agency: In-house. 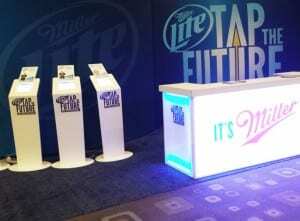 Brought its nationwide Tap the Future program—which invites consumers to submit business ideas online that get connected to live events, judgings, reviews and eventually to $300,000 in seed money—to the main floor of the Austin Convention Center. A small footprint handed out free beer and invited attendees to a row of Facebook kiosks, on which they could sign into the program and submit ideas. Brand ambassadors promoted mltapthefuture.com and reminded people to use #tapthefuture. Agency: Flowers Communications Group. With a product portfolio spanning cell phones to smart homes, the company spread its wings with multiple pop-up footprints in and around the event. The biggest? The huge AT&T Mobile Movement experience across the street from the convention center, a warehouse turned into an interactive exhibit on our “connected” lives (Agency: Vice Media). During the day, the footprint featured interactive games, social media-powered phone booths and a series of new documentaries on the connected lifestyle (plus free lunch at certain intervals, a nice way to bring in the crowds). At night, concerts and djs. Overall, a solid mix of content and entertainment. At the convention center an AT&T Lounge featured wood touches, an area to sit in and lockable charging lockers—drop your device off, they plug it in and give you a key to the locker (Agency: BMF Media). Across town at 6th and San Jacinto, an AT&T Digital Life display (built by CGS Premier) equipped with a fully functional AT&T Digital Life system gave consumers a chance to experience the ease and convenience of AT&T’s home security and automation system. You had to see it to believe it—a Trending Vending Lounge that invited SXSW attendees to create and then 3D print a custom edible Oreo based on topics trending on Twitter in real-time. 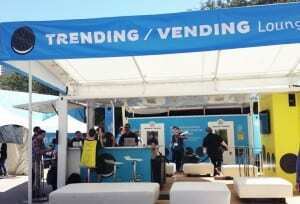 Guests were invited into the footprint—anchored by customized shipping containers—where they could first swing by the cookie bar for a glass of milk and a dunk before hitting the full-size Trending Vending Machines, which allowed them to surf around SXSW-related hashtags—which then influenced a mash up of 12 flavors, colors and crème printing patterns to create one of 4,000 possible cookies. And yes, you could eat them. Check the hashtag at #eatthetweet.com. Agency: MAYA Marketing. Turned what in years past was a Blogger Lounge in one of the convention center’s upper-level rooms into the PayPal Social Media Lounge, hyping the brand’s mobile payment solutions. Part coffee lounge, part bloggy classroom, the room featured wood tables (with hard-lined Ethernet cables), chalkboards and a front area featuring live Q&As and presentations facilitated by partner TechSet (and amplified by #paypalit). Best part: There was an actual coffee cart and a small retail area selling a variety of things (ear buds, playing cards, umbrellas) for a penny. A great price—but in order to buy anything attendees would need to download PayPal’s mobile payment app and use that to purchase. A solid way to push trial. 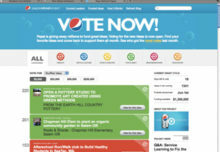 Agencies: PBJS; Factory 360. Sometimes Samsung likes to remind other brands that when it wants to, it will out-think, out-spend and out-experience the others. 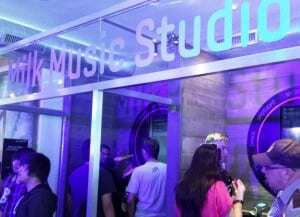 And such was the case in Austin, where the company turned Micheladas restaurant into the two-level Samsung Galaxy Experience, used to promote the company’s device portfolio and new 200-station MILK digital radio service. If guests walked through the front door and turned right, they entered a living room-style room boasting comfy couches and a Galaxy Vine Studio in which they could shoot mini shareable videos. There was also a My Galaxy Bar giving Samsung owners free loaners of other products, freshly charged batteries and tips and tricks. Had guests turned left, they would have first encountered a juice bar serving cold beverages and a MILK Studio that let peeps sample the service’s 200 stations. Next was a customizable Merch Station where attendees could design their own t-shirts using a Note 12.2 tablet. Outside in a private courtyard there was music, drinks, a taco/churro bar and a photo activation interactive. On the second level, yoga and CrossFit classes showed off the fitness monitoring capes of the Samsung devices. What else? Just a little concert featuring… Jay-Z and Kanye West. Together. Agency: PMK*BNC. If a toilet paper brand can get it right at SXSW, then you can, too. Those that have been to the festival know that South by Southwest features a lot of people running to a lot of different places. It’s fun, it’s exciting—and it’s sweaty. The Cottonelle Refresh Lounge provided a way to, well, refresh. Guests entered the tented pop-up to partake in a variety of “ahhhhhhh” interactives, from massages to hair and makeup touch-ups to shoe shines. Folks could also charge their phones, store their luggage or bags and grab some drinks. The cost? One social media mention using the #letstalkbums hashtag (love that use of social currency.) Helping facilitate the conversations was a team of social influencers dubbed the “Cottonelle Correspondents” who reported live from the lounge and shared photos and behind-the-scenes information. Agency: Ketchum. Chevy was, in a word, everywhere. 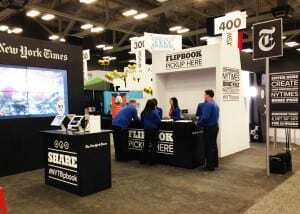 The biggest activation (“connecting the connected”) with the most elements, the broadest reach and the most feet on the street at SXSW—all promoting the brand’s high-tech vehicles. The Catch a Chevy program invited attendees to flag down one of the fleet’s vehicles for complimentary rides—sort of a combination Uber/test-drive. There were also test drives on Trinity between 2nd and Cesar Chavez that let folks take a Chevy for a spin (Agency: Jack Morton; Execution: Next Marketing). Inside the convention center was the Find New Roads Lounge (Agency: EventLink), which let peeps check out the new 4G capabilities in the new Chevy models and the social media feeds connected to #thenew hashtag (the footprint also held developer workshops on building apps for vehicles). 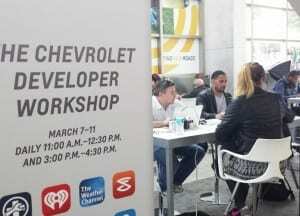 Elsewhere: a Chevy Courtyard on Cedar Street with three nights of concerts, a hackathon and the fifth year of the Tweet House (at Mellow Johnny’s Bike Shop), where attendees could come discuss innovation and technology.